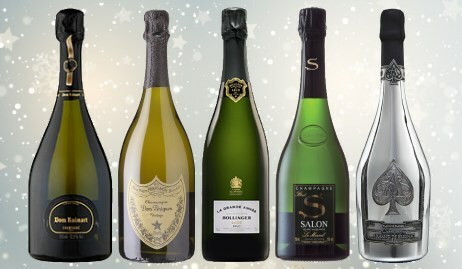 A fabulous evening which I co-organised and tutored at Christmas 2016, when an audience of 30 gathered to taste these 10 top Champagnes, including some of the world’s rarest and most expensive deluxe cuvées. It really was a superb line-up of wines – not without some controversy as the audience debated their prices and relative merits – but pretty much a once in a lifetime line-up. I intend to present similar evenings under my Festival of Wine banner in future: small-scale events eaturing the world’s ultimate Champagnes, so please do keep an eye open for that. (2017) Lemony freshness and ultimate delicacy here, just dazzling and rather fabulous, hints of buttery brioche add roundness and a touch of pleasing softness, but it's the filigree acidity and freshness that drives this. (2017) Fabulous nose; much more open and giving than the 2002 vintage was at the same stage, complex but terribly pure and fine. The palate ha a certain nuttiness, a Cox's pippin English apple quality, but quite dazzling acidity, the mineral quality so long and fine. (2017) Lovely yeasty, biscuity character here, toasty but pin-sharp, just blazing with sheer Chardonnay fruit with that hint of creaminess. Lemon pithy and dry, it's a savoury style with some grapefruit intensity, lovely balance and terrific length. Certainly plenty of cellaring potential here too. (2017) A surprisingly high, almost marzipan-like note to this, a touch of elderflower and lightly tropical fruit character is quite arresting. The palate has a Brazil nut roundness, open and charming, easy to appreciate, but it does finish with exemplary freshness. (2017) R.D. standing for 'Recently Disgorged', that means this wine spent over a decade on the lees, and is a Pinot Noir and Chardonnay blend. Fabulously meaty and nicely developed toastiness on the nose, a touch of truffle, then the palate has equal chewy richness, a strong mousse, and yet hallmark Bollinger freshness because of the line of acidity. An excellent wine, drinking really well now, but no reason to hurry it. (2017) Richard Geoffroy used the highest ever proportion of red Pinot Noir wine in this blend, 27%, making it a decidedly meaty, Burgundian Champagne, with truffle and forest floor, vinous with red berry fruit. That welterweight of flavour slightly butts up against the acidity at this stage for me, tannins too against grapefruit, suggesting perhaps that a few years in the cellar will do this no harm. (2017) This brand, colloquially known as 'Ace of Spades', attracts a lot of scepticism because of the bling packaging and the fact that it is owned by musician JayZ. But analytically this is a fine all-Chardonnay blend of the 2009, 2010 and 2012 vintages that is pretty and floral on the nose, with some rosy apple and a touch of creamy oatmeal. Lots of juicy, lemon and lime fruit and acidity, though there's a certain silkiness to the texture and mousse too. (2017) Also quite delicate, this is a blend of Pinots Noir from 2008, 2009 and 2010, disgorged in June 2016 to just 2,333 bottles. There is a more earthy character in comparison to the BdeB, the sweetness of the fruit on the palate is generous and easy, although it tightens up crisply on the finish, a fairly dense character that suggests a couple of years in the cellar might benefit the wine.